Place a pot of water to boil with 1.5 gallons of water and 3 tablespoons of sea salt (can be substituted with kosher salt). Meanwhile, peel both types of asparagus. 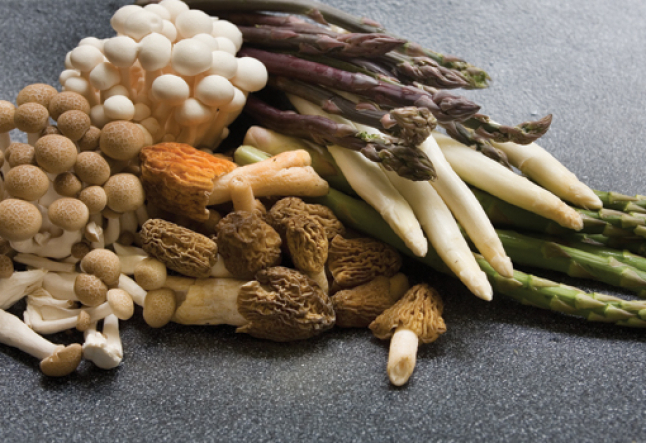 Prepare a container of iced water, which will be used to stop the cooking process of the asparagus (also referred to as “blanching”). 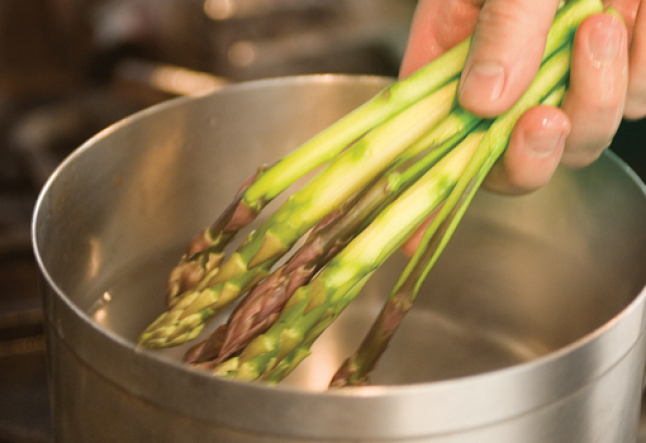 Once the water boils, plunge the asparagus for about 20 seconds (depending on thickness). 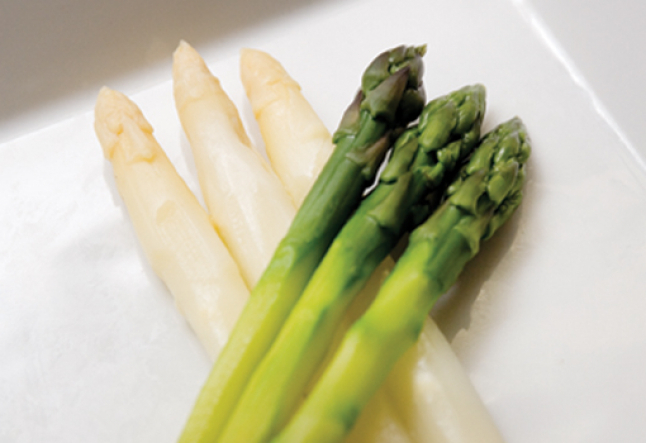 Remove the asparagus and stop the cooking process by plunging them in the iced bath. Drain the asparagus once cold. Clean the mushrooms and cut off the bases. Sauté the mushrooms in olive oil, then add the minced shallots and continue to sauté for one minute. Season with salt and black pepper. Remove from heat. Add the minced chives and parsley. Once cooled, add 2 tablespoons of truffle vinaigrette. 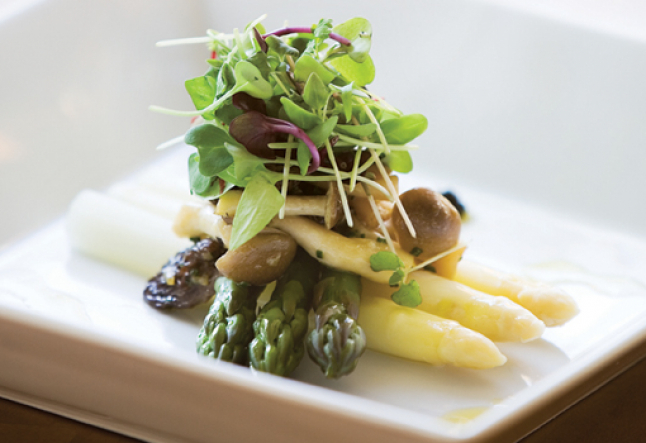 Marinate the asparagus just before serving with the 2 tablespoons of truffle vinaigrette. Jean-Claude Plihon, executive chef with an extensive experience in luxury hotel cuisine, believes the key to excellent food is simplicity, as he demonstrates with this contemporary, easy-to-prepare appetizer. “One must be true to the flavors,” says the award-winning chef, who earned his degree from the Culinary School of Chambery, France, in 1982. 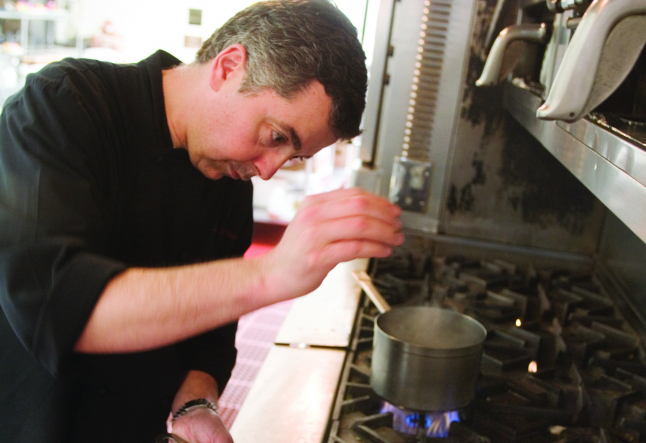 Plihon held top culinary positions all over the globe and incorporates original flavors from various cultures into his creative cuisine.